Goldfein: To prepare to fight from space, the Air Force will have to invest in new technology but also in the training of leaders. ORLANDO, FLA. — Gen. David Goldfein’s speech on Friday represented the strongest rhetoric yet on space warfare as an area that deserves special attention from the U.S. Air Force. 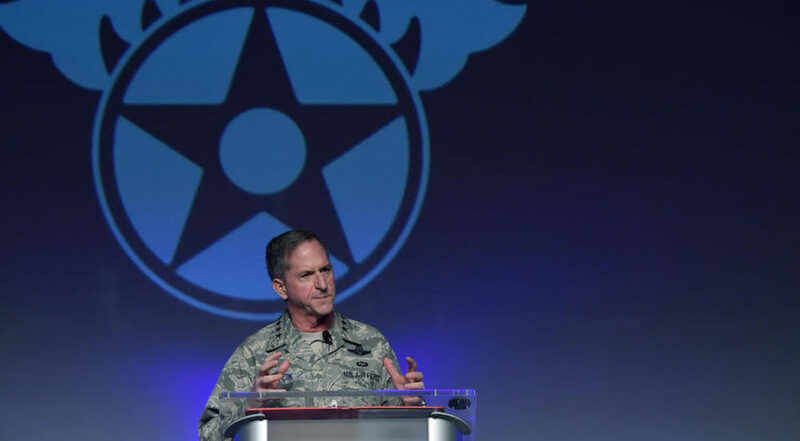 Goldfein, the Air Force’s chief of staff, told a large audience of active-duty airmen that they have to start thinking about outer space the same way they think about airspace. It is not a question of if but when airmen will be fighting in space, warned Goldfein. And he insisted that the Air Force has to become more attuned to what is happening in space and look upon space as a key battlefront. Although Goldfein had made similar points in past speeches, this one stood out as more emphatic and stark about the role of the Air Force in space warfare. Goldfein has been a proponent of “multi-domain operations” — the idea that, to prevail in future wars, commanders need battlefield intelligence coming from “all domains,” including air, cyber, ground, sea and space. “I look forward to discussing how we can leverage new technology and new ways of networking multi-domain sensors and resilient communications to bring more lethality to the fight,” he said.